When done right, mosaic tiles can transform the look and feel of a space as well as making it easier to maintain. Tiles tend to be used mostly in the bathroom and kitchen and can be a daunting investment that needs a good understanding of materials and their most suited locations. We have put together a guide on how to find the right pick for the right tiles. Featuring many different benefits to this space, kitchen mosaic tiles can help to protect walls from damage, are easier to clean, are more hygienic and are well suited to the high heat and humid situations that cooking creates. A room with many uses, the kitchen has two particular areas that are suited to different types of tiles. The tiles that you choose for your kitchen splashback need to be able to handle high heat, humidity, regular staining and splashes. Because of this, porous materials such as brick should not be used. The best mosaic tiles that you can pick for a kitchen splashback are either glass or metal. Metal is a material that has become popular in recent times, partly due to its cool versatile look, low maintenance and functionality. Available in a variety of colour tones, metal mosaic tiles look particularly great in minimal, Scandinavian or industrial interiors. We also provide metal mosaic tile designs in high shine finishes and tones of pink, platinum or bronze, which are perfect for chic, luxe looks. Metal is a great choice for a kitchen splashback as it is highly heat resistant, hard-wearing and easy to clean. The tiles that you decide to use in the area around your kitchen sink need to be able to handle regular exposure to water, dirt and chemicals. 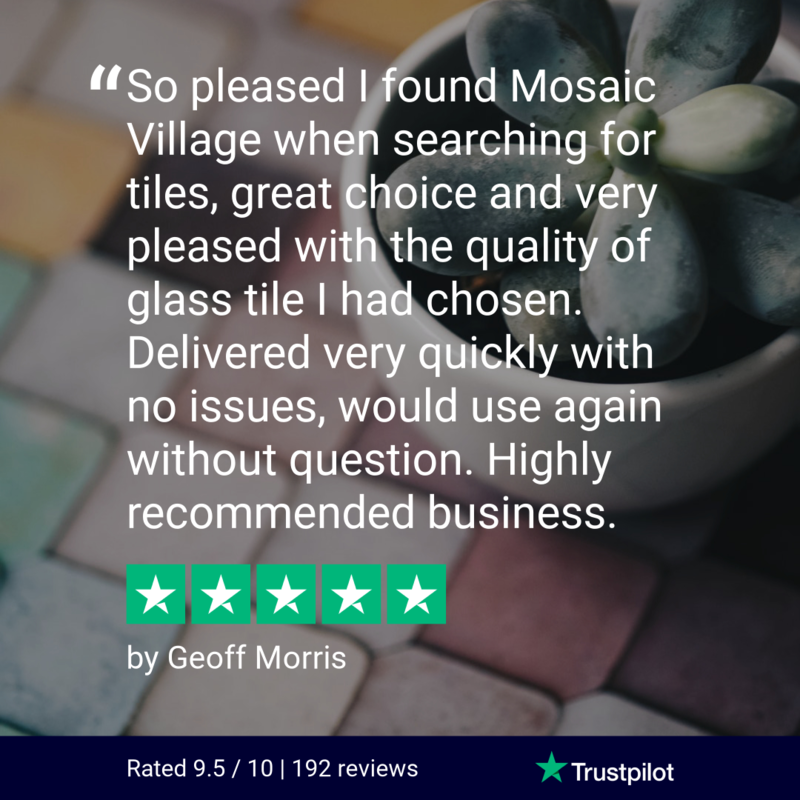 With this in mind, glass mosaic tiles are the best option. For high-traffic areas, look for designs that incorporate a variety of colours or textures, as these will look cleaner for longer. Don't feel obliged to stick to traditional kitchen colours and use mosaic tiles as a way to express personality and colour in a space. Our hexagonal honeycomb tiles and sparkle tiles are particularly suited to this area as they feature a depth of dirt-hiding texture. Many bathrooms have more tiles than painted walls, due to their practicality in such a wet and humid area. With a surge in popularity for walk-in wet rooms and large shower enclosures, bathroom mosaic tiles can create striking, bold centrepieces to a room and transform a small space. Brick and glass mosaic tiles are great options for a bathroom, as they can be easily wiped clean and will not interact with any cleaning chemicals. A mixture of coloured glass mosaic tiles displayed in vertical or horizontal strips can create an eye-catching look that enables you to get inventive and personalise your space. To create an on-trend monochromatic look, pair a white subway tiled wall with black mosaic border tiles. Similar to kitchens, bathrooms need to be able to control a lot of steam, humidity and water. Therefore, the best bathroom tiles to use are glass, brick mosaic tiles or mixed mosaic tiles. For that ultimate dramatic feature, opt for large glass mosaic tiles which are extremely popular for bathrooms. A relaxing shower can be the highlight of anyone's day, so why keep your shower boring and tedious to clean? Introducing mosaic tiles into your shower enclosure can really brighten the room up and be the main focal point. Glass mosaic tiles allow the shower to be easily cleaned, by eliminating that “waterproof paint” you can instead wipe clean and be sparkling clean.